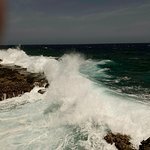 Get a comprehensive tour of Curacao's northwest coast that focuses on the power of the island's wind and water. A guide will help you understand these natural phenomena, including a natural fountain, a natural jacuzzi, and a water cannon. Explore Shete Boka Natural Park in an open-top 4x4 vehicle, able to access parts of the park that traditional vehicles can't. Hotel pickup and drop-off makes for a seamless experience. Begin your tour of northwest Curacao's natural phenomena with convenient hotel pickup. Climb into a 4x4 vehicle, optimized for the island’s rugged terrain so it can access areas many traditional tour vehicles can't. Relax as your guide takes care of all navigation and transportation. Visit the island's mini desert, where you'll learn about the the volcanic and coral geological origins of the island. Head to a natural jacuzzi, created by the power of the waves and wind against the land. Watch the seafoam create colorful fountains, while your guide explains the how and why of this natural display. In Shete Boka National Park, visit a cave that produces thundering sounds as the water rushes in and out, called the "breath of Curacao." 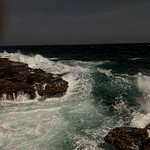 Finally, visit Boka Pistol, an inlet where the waves smash so hard against the coral wall that it sounds like a gunshot. Great adventure and fun trip! Great half day trip off the cruise ship!! Had Alan as our guide/driver of an 8-person Land Cruiser trip. Great info on the sights and history of the areas visited. Would definitely do the trip again. 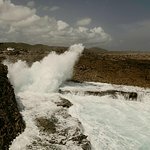 Get quick answers from Breath of Curacao and Shete Boka Natural Park Jeep Tour staff and past visitors. Can jeep accommodate 2 adults and a small 12 yr child ? Arriving Apr 17 @ 8AM Navigator of the Seas. Do you pick-up from terminal? Thx.